Turning Totems is a mobile slot of 5 reels and 11 paylines backed by ThunderKick platform. You can play this slot using coin sizes of 0.2 per spin to 100 per spins. It means this slot machine is for every player. RTP or return of player of this slot is 96.1%. The game has many options that should be checked before playing it. Like the “Number Coin” can be used to open the betting panel to set the coin size, the “auto Play” option can be used to turn the reels in motions automatically without any middle interruption and ‘spin” option will turn the reels in motion. Play Turning Totems for real money at ThunderKick Casinos. As the name suggests, this slot i.e. Turning Totems is inspired by totems and by Mayan Culture. 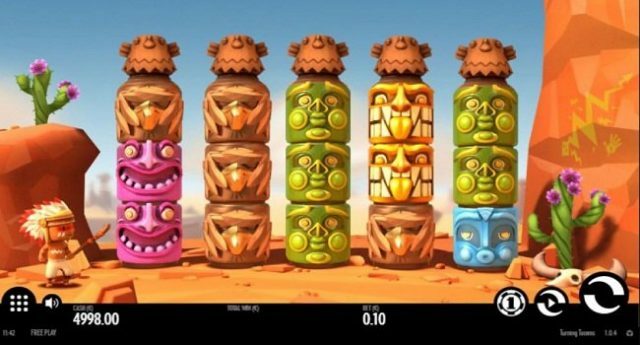 The reels of this slot are being set against the desert background. You should play this slot game because it has a very catchy sound and a great playing environment. This slot has many features like wilds, scatter and bonus symbols. The sleeping totem is the wild symbol in this game which can substitute all other symbols except the Thunder Snake symbol. After appearing, the wilds can form real money winning combinations. The Thunder Snake is the bonus symbol in this game and it will offer you re-spin. If you hit 3 or more of thunder reels, you will trigger bonus feature and that means 5 free spins will be awarded to you.